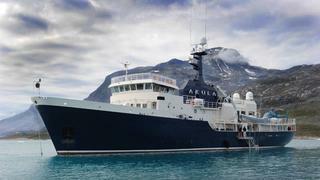 Simon Ting at bluewater tells me he’s signed the 59 metre expedition yacht Akula for sale. Built by Holland’s Amels yard in 1974 as a pilot vessel for the Dutch Navy, she was converted into a superyacht by Vosper Thornycroft in England in 1999, at which time a helicopter deck and hangar were also added. Three Deutz 600hp engines give Akula a cruising speed of 13 knots and her rugged build quality makes her capable of worldwide cruising. Her asking price has been set at $14,750,000.